I'd heard the horror stories before, the names like "Bridge Walk" and "Bridge Push-Your-Bike," and I'd vowed to never take part. Something about having a kid, though, pushes you outside previously set boundaries and into doing things you never would have before. Like learning the names of all the Thomas the Tank Engine characters or signing up for Bridge Pedal. Riding with me were my almost-two-year-old son Everett in the cargo area, my wife on her bike, and two of our friends on their bikes. 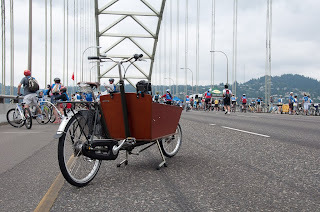 It was the first Bridge Pedal for all of us. We got to the beginning of the ride right at our 9am start time, ready for whatever was to come. And when I say ready, I meant it. The bike was loaded with diaper changes, extra clothes, cameras, water bottles, GPS (no, I wasn't worried about getting lost -- I just wanted stats on the ride), snacks, books, and toys. 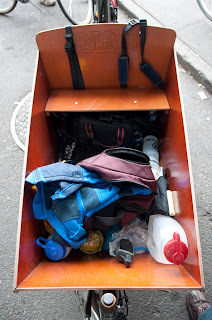 We might have overpacked, but that's one of the fun things about a Bakfiets: an extra 10 pounds is only 10% of the weight you're pushing anyway! 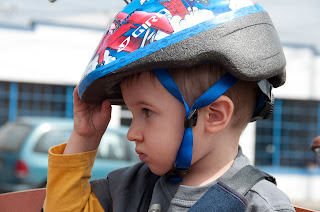 Everett insisted on holding onto his helmet for most of the ride. I think he was worried about the wind blowing it off (because I was so speedy, of course). He's had that trouble with hats before, and is now extra cautious with them. Technical details: 3806 photos, one every two seconds with the built-in intervalometer. The camera is a Nikon D200 with an 18-55 zoom lens. The photos were taken at 18mm, except on one downhill bomb where it vibrated itself out to about 24mm. Exposure times were around 1/10 to 1/20 or so of a second, to induce enough motion blur to keep it from looking too stuttery. Another Bakfiets makes an appearance around 02:17 and can be seen a few times after that. The rider told me he was renting the bike for the ride. What an introduction to the bike! All that weight = speed and momentum on the descents. Even uphill, I was still faster than a lot of people. They must not know how to use their gears, because I'm not in that good of shape. I'm proud that I didn't need to push the bike at all. There were two hills where I pulled over and took a 30-second break to stretch my legs, but that's it. 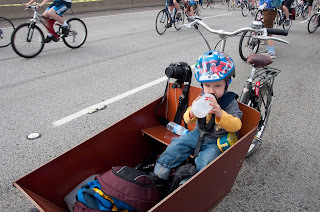 Here's Everett in the bike, with water bottles and Cheerios close at hand. You can see my camera mount to his right. He didn't notice or try to play with the camera until almost an hour and a half into the ride. 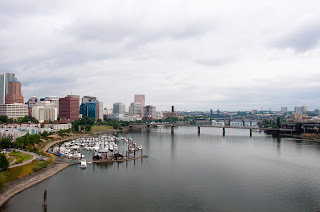 Obligatory scenic shot, looking north from the Marquam bridge. There were a few aggravations, mostly due to rider etiquette, but we all had such a great time I don't want to be too negative and detail them out. We'll definitely be back next year.